Welcome to Lehigh Acres, Florida. Half-built homes litter the seemingly endless grid of half acre plots in a town born of speculation. Countless dreams were built on the promises of Lehigh Acres, where the allure of a wholesome American community was matched by the economic rewards of affordable land ownership. It was about fulfilling the American dream on soil parcels in undeveloped southwest Florida. For decades, things went roughly according to plan. By the mid-2000s, however, the dreams that were sold as half-acre lots to Midwestern retirees and families had turned into gold, surging in price at breakneck speed. And then, like a game of musical chairs, the music stopped. 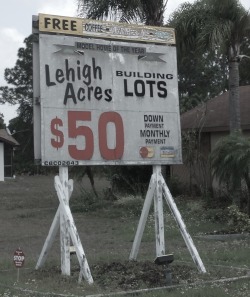 DREAMS FOR SALE is a documentary film that traces the dramatic story of the rise and fall of Lehigh Acres, told through the eyes of its citizens. It is a tale of hope and despair, of prosperity and loss, and of memories and dreams.